What we did instead was plan our future. Most people spend more time planning their 2 week vacation than they do planning their life time. I started with an idea I heard on one of Life’s CDs, about how to come up with what really matters to you. The speaker said to separate the sheet into 3 categories; Do, Have, and Become. 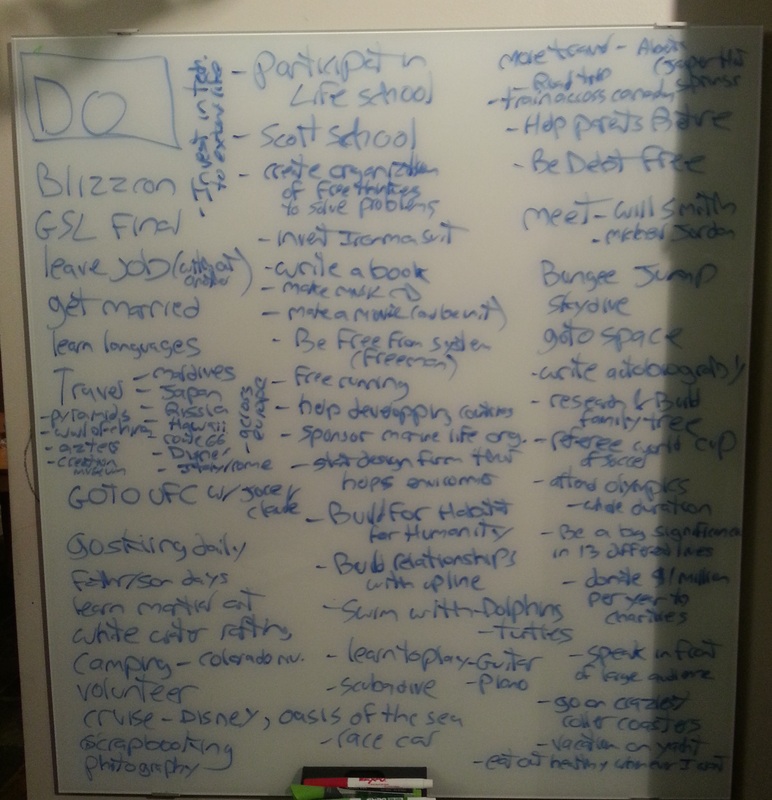 We took 20 minutes to list the things we wanted to do in our lives (vacations, activities, etc. ), what we wanted to have (cars, houses, etc), and what we wanted to become (best selling authors, great parents, recognized leaders, etc). 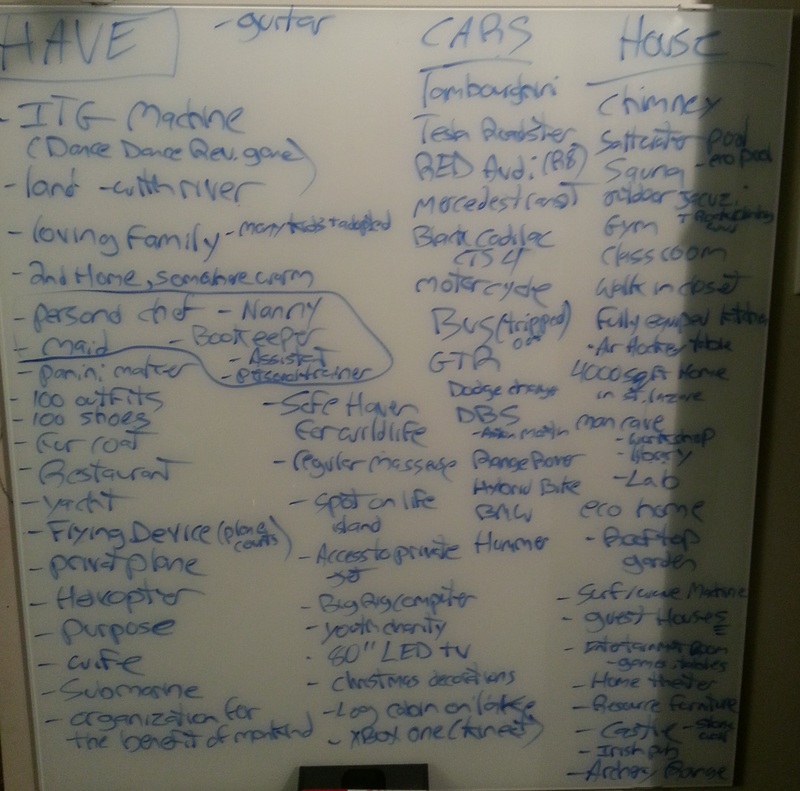 I then wrote everything down the board as we all said what we wrote down, there for everyone too see and get inspired from. I copied down a few things into my own notebook that I didn’t have earlier; you’ll get to see these on my new top 100 list in January. The next part is probably the most important. It’s great to set goals and list them out, but if we want them to happen, we have to really focus on them properly. I have actually not been doing what I should have for the past year, as I only looked over the list over and over again. What I was missing was what some people refer to as the commercial we play to ourselves; the visualization. The last step of the evening was to try and figure out which of the items we had written down called out to us the most; which were we the most passionate about. When we had that, it was time to create that commercial for ourselves. 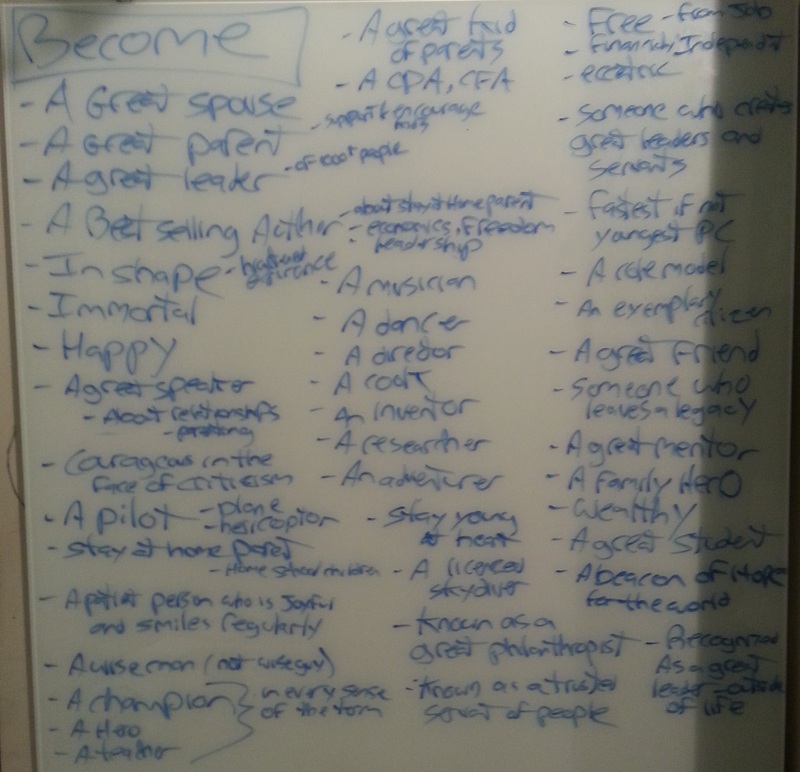 Some people started working on their dream board (a board with pictures of that passion, cut out from magazines or printed from pictures online) that they can keep looking at, while others started writing their future story. This story should not be just a list of actions, but it should be referring to your senses. Our subconscious minds which we are trying to program doesn’t function in words; it works with images and feelings. You need to write about how your going to feel, what your going to see and smell; what you will sense. I cheated a little here, as I have two strong passions I think. One is to leave my job and not have a boss or a company that owns my days, and the other is more about recognition and speaking in front of others. I started to write about when I’m going to talk on stage at a seminar here in Montreal, about my last day at work. I wrote about the song that’s going to be playing as I walk out on stage (its Nightwish’s Ghost Love Score starting at the 5:34 mark; although it is still a debate on whether I start at 7:09). I wrote about the bright lights and the nervousness of speaking in front of people that I know personally since I’m from Montreal. I then started to write about myself describing my last day at work, and how that is going to feel. I haven’t finished this yet, but it’s a work in progress that I plan on finishing before the week is done. Once it is complete, I will need to start reading it everyday and imagining it in my mind each time. Have you focused on your future lately? Do you have a commercial that plays in your mind everyday? Or just to get you started: what would you do if time and money were no obstacle?